Around 8 months you may notice your baby biting off large chunks of food and likely spitting them out. She’s mastered the idea that food goes into her mouth, has learned how to maneuver it around and now it seems like she wants to actually eat! It’s at this point that all the baby-led weaning books and advice may begin to become unclear. 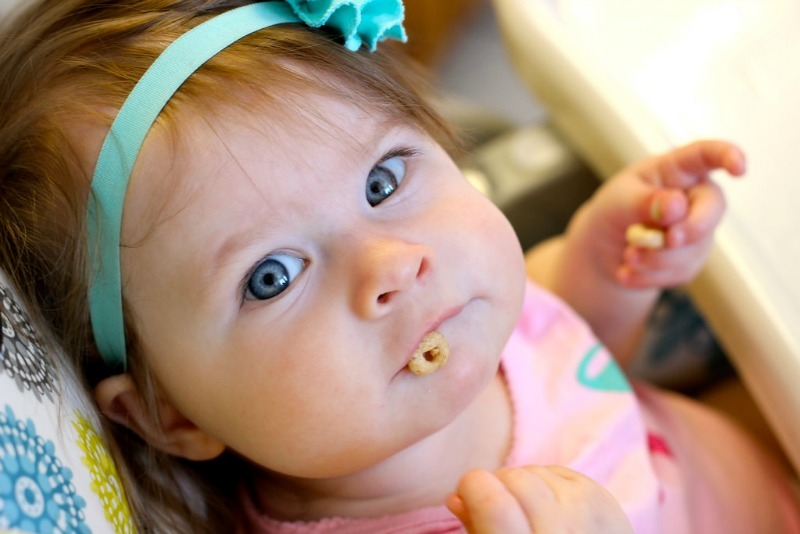 Do you continue to exclusively give your little one larger pieces of food? How do finger foods come into play (if at all)? Really, there is no right answer. It truly is dependent on your baby. If she is satisfied with gnawing on her food and successfully swallowing small bits, continuing on like you’ve been may work for you. But if your little one is like mine, you may need to change things up a bit. Our baby was ready to eat, like really eat. She was impatient. She got the program; learned how to chew but would swallow without doing much of it. A floret of broccoli irritated her because she could only get small tastes at a time. I was uncomfortable with how eager she was so I improvised and incorporated baby-led weaning principles with finger foods. So if your baby is ready for something more than learning, but has not yet developed the pincer grasp, you will appreciate the following advice brought to you by one eager baby. One pot meals work great for this stage. Chicken and rice with shredded zucchini was a favorite at our house. The small bites of chicken cooks until very tender and can then be shredded easily in baby’s bowl before serving. Another favorite was Creamy Cilantro Bean Casserole. Dish up a small serving (about ¼ cup) into a suction bowl, cool, stick to the highchair tray and watch his face light up. He will love being able to feed himself such a delicious meal. Since he hasn’t yet mastered the pincer grasp, he will use his entire hand to dive into the meal you have prepared and then, yes, his whole hand will go into his mouth. But not at first, a taste must come first. If he likes it, get ready, it’s messy. But it’s priceless to see. Ensure that the size of the foods in the bowl are around ½ inch in size (basic guideline for starting finger foods) and soft. The reason for this is she will likely grab a large handful and stick it in her mouth. Yes, she’ll chew a bit, but there may be too much going on in her mouth for her to identify a much larger food item amongst the other small foods in her mouth. Keep it fairly uniform in size so there is no worry. Wait. Soft, smaller foods? Isn’t this going against the principles of baby-led weaning? No. Your baby will be feeding herself and chewing before swallowing, which are the main principles of baby-led weaning. Finger-sized fruits, vegetables and breads as discussed in How to Start Baby-led Weaning. Try Maple Banana French Toast Fingers tomorrow for breakfast! Fritters made from shredded vegetables cut in half. Puree-like foods (yogurt, applesauce, oatmeal etc…) served on a pre-loaded spoon then handed to him to put into his own mouth. Softer, smaller foods like chicken and rice, casseroles, components of soups without the broth, (Minestrone works well) served in a bowl or on a pre-loaded spoon. Sautéed and chopped vegetables/fruits like spinach, squash, tomatoes, apples in a bowl or on a pre-loaded spoon. Tender and moistened meats preferably shredded or ground with gravy or broth to moisten in a bowel or on a pre-loaded spoon. Traditional finger foods to work on the pincer grasp. Make food bites about the size of a pea. Hold a softer fruit (nectarine, peach, plum) with a bit of the skin peeled for her so she can take bites if she doesn’t like to hold the large fruit herself. Most any food on your dinner table will work at this stage, just prep accordingly for baby! Like stated in previous articles, make good food! If you don’t like how it tastes, your baby most certainly won’t either. That said, always taste your baby’s food before serving and check for taste and proper temperature. You will find that your baby will be proficient at feeding himself just about anything, large or small with this method. Around 11 months it all comes together. He will start to pull apart larger pieces of food, like bread, before putting it in his mouth. For he has learned that smaller items are manageable in the mouth and he can easily chew and swallow them. You may wish to hold off on foods that close family has a severe allergy to. Research doesn’t conclude this is necessary, but it may be prudent. Sweetened fruit juices; they’re just not needed! Instead, blend up fruit with water for a “whole juice”. Many parents are unsure about how much water to give baby at this time. From the age 6-12 months offer water in small plastic cup (you hold it for her) or a straw cup at meals and throughout the day. 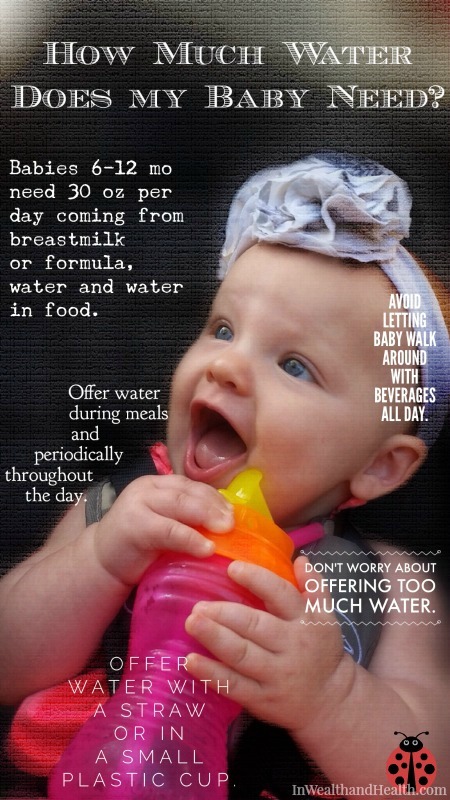 The adequate intake (AI) set for babies this age is 30 US ounces. Counted in this 30 oz are bottles/breastfeeds, the water content in food, plus the water offered with and between meals. Don’t worry about offering too much water. Just like with eating, your baby should be in control of her own intake. However, avoid letting your baby having free reign to walk around with the bottle/cup at all times. One of the most frequented questions is, “How many meals a day do I serve?” and “When do I increase them”? This all depends on your baby’s eagerness and how much time you are willing to commit to the process. Like recommended in How to Start Baby-Led Weaning, start baby off with one food at a time; it’s a good idea to begin slow, with one ‘meal’ a day for the first few weeks or so. Ideally, wait a couple days before introducing another new food. Be observant for rashes/hives, GI issues or shortness of breath that may indicate a food allergy. Gradually work up to providing a few different options at each meal. If your baby is doing well, I would recommend at 7-8 months to provide two meals/day and to add the third around 9 months. Snacks come later starting around 10 months but, it depends on your weaning. So baby is eating well, what’s the next step? Weaning from the breast and bottle. After all it’s part of the name: baby-led weaning. At this point continue to offer breast milk or a bottle within the hour before a mealtime. Sooner than later, your baby will begin to take less before the meal (likely the largest meal he typically eats). He will learn that dinner is near and therefore he doesn’t need much milk then. It will likely take a couple months to fully wean off one feeding. Babies will wean slowly and methodically if you keep your meal times consistent. Be sure when washing your baby’s highchair tray that you are using hot water and soap with a clean scrub brush or wash rag. Always wash your hands and your baby’s hands before each meal. Bon Appétit and happy baby-led weaning! If you are looking for some great recipes, follow my Baby-led Weaning Pinterest board! Your baby will be a toddler soon! Be sure you know about their nutrition needs, read Toddler Nutrition Needs, Age 1-3 for detailed yet easy-to-read information, written by a dietitian. I think your product is amazing…we used a cup very similar right from the start! I will certainly add. Followed you over from the dietitians on the blog facebook group. Love getting baby-led weaning advice from a fellow dietitian. We started out with homemade purees but my 8 month old baby girl doesn’t dig that and lets us know she’d rather eat what we eat so I’ve kinda transitioned to this approach, thanks for the advice! 🙂 Also we LOVE our Ikea high chair! Awesome, awesome! So great to meet you! I’ll be sure to connect. And thanks for the lovely comments! I loved this article and thought you would too. 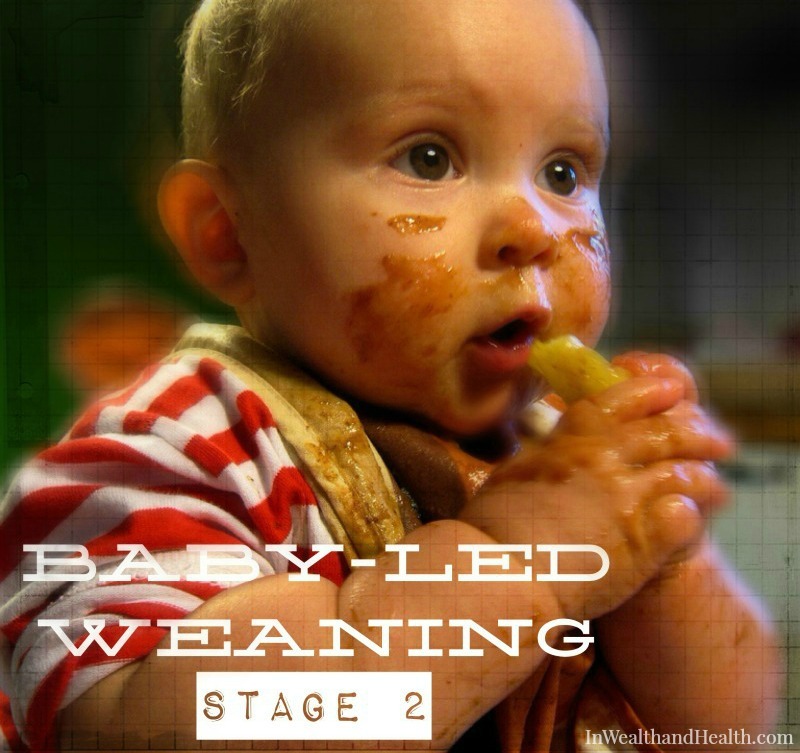 Here it is Eating with Baby-Led Weaning: Stage 2 located at http://www.inwealthandhealth.com/eating-with-baby-led-weaning-stage-2/.